Estonians fleeing the aftermath of WWII and Soviet occupation found their voice in Australia via a newspaper. It continues to this day. Silvi Vann-Wall reports on Meie Kodu and the community it continues to serve. In the tumultuous time after World War II, and throughout the Soviet occupation of their tiny country, many Estonians sought refuge in Australia – which for them held the promise of being as far away from the conflict zone as possible. As war refugees, Estonians were required to live in migrant camps such as those in Bathurst or Bonegilla, before being given jobs and a chance at integration into Australian society. Meanwhile, a small committee, formed by the Sydney Estonian Society, were hard at work acquiring authorisation to publish the first Estonian newspaper in Australia: Meie Kodu. Literally translated as “Our Home”, Meie Kodu was a fitting title for a paper that hoped to bring comfort to hundreds of refugees in a strange land. It would be published in the Estonian language only, and bring news of the latest developments in Europe as well as of happenings in Australia. Though small, it was to become a key part of easing the transition between European and Australian life. The Sydney Estonian Society decided in 1949 that such a newspaper was sorely needed. So, in February of that year they called a meeting, led by chairman Toomas Varik, to request formal permission of the Australian Government for this paper to be produced. It was also decided that chairman Varik would be the paper’s publisher. Undeterred by this proviso, the Sydney Estonian Society soon formed a small news team, led by founder Ilmar Raudma. The team, all volunteers, got down to work straightaway, transcribing articles letter by letter on to a printing press, and printing photos from special plates – often working all night. The first issue was published on August 19, 1949, and more than 300 copies were printed. 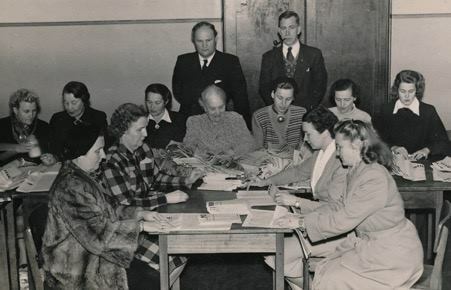 Volunteer packers and transport providers ensured rapid distribution throughout the Australian-Estonian community. Thanks to their efforts, copies of Meie Kodu soon made their way to the migration camps, sparking an understandably emotional reaction for many detained there. “Really, so far from home and [we have] our own newspaper!” writes Ülle Slamer in her History of the Newspaper Meie Kodu (quotes from which have been translated from Estonian). Raudma had arrived in Australia only a year before the founding of Meie Kodu. It was no doubt a relief to be overseeing a newspaper in a country where press freedom was significantly greater than in the USSR – where articles were heavily censored. Unfortunately, Raudma died of leukaemia in 1951, leaving the role of editor-in-chief to Arnold Lond. In February 1954, the team were finally permitted to publish entirely in Estonian. This meant that newcomers struggling with the strange mechanics of English didn’t need to fret when reading their weekly news. “The first decades of the newspaper were not easy,” writes Ülle Slamer. Volunteers rarely had formal training, and the long nights spent resolving mechanical issues with the printing press were incredibly frustrating. The only pay they ever saw was a small reimbursement for the Sydney Harbour Bridge toll. It was often difficult to obtain information from the international scene, due to both technological and political constraints. “Not much news passed the Iron Curtain,” says archivist Eili Annuk. But Meie Kodu persisted and, contrary to what Wikipedia might declare, the paper did not cease production in 1955. After all, they had a mission to “keep Estonia alive in the hearts of expats”, says Reet Simmul, assistant archivist at the Estonian Archives in Australia. It’s thanks to these archives, established in 1952, that one can now access the first 50 years of the paper digitally. A curious article from 23 November 1950 – ‘Speak English Correctly!’ Accessed from the Trove digital library archives. During this time, Annuk began compiling a written catalogue of every copy of the paper for the Estonian archives. In 1991, just near the end of Kroll-Simmul’s time as editor-in-chief, Estonians made world headlines by reclaiming their independence. ‘ESTONIA REGAINS INDEPENDENCE’, Meie Kodu, Vol. 43 Issue 29, 21 August 1991. Source: ESTER digital archives. But, as current editor Aune Vetik explains, production still involved plenty of manual work until 2004: volunteers did page layouts by the old cut-and-paste method, and the measuring tool “was an old rope”. Vetik, an Estonian national who first read Meie Kodu 14 years ago, assumed the editorship in 2011 and admits to being a little taken aback at how old-school the paper was. Meie Kodu’s front page on 31 May 2018 Note the balance of local events and world politics. The mission statement has also changed: “The voice of Estonians since 1949”. According to Reet Simmul, going online and recruiting formally trained sub-editors improved the paper enormously: “The local articles [such as] reviews of amateur plays, church [and] coffee evenings at Estonian Houses have decreased,” she says, which has resulted in a broader scope of international politics and significant Estonian events. Around Australia, absorption of Estonian communities into mainstream society is a cause of concern for all generations. The advent of an email subscription service is just one way Meie Kodu hopes to resolve this issue. After all, without the economic benefits gained from a lively Estonian-Australian community, the paper’s future is at risk. Publication costs are rising, and the news team are most often left to rely on public donations to bolster funding from Estonian committees. The print run, at only 220 subscribers, is consequently quite small. Meie Kodu’s office, circa 2016. Photo: Aune Vetik.